of each month at the Bromley Temple Salvation Army Hall, Ethelbert Road, Bromley BR1 1HU. 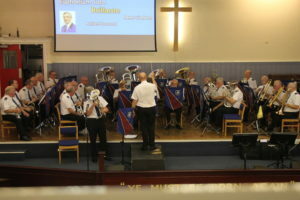 The South London fellowship Band commenced a very busy period on the Friday before Palm Sunday, with a musical programme presented at the United Reform Church in West Wickham. A report of this event will appear here in due course. 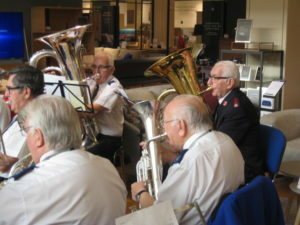 On the Saturday, the band was involved in a birthday celebration for one of it’s oldest and longest serving members. 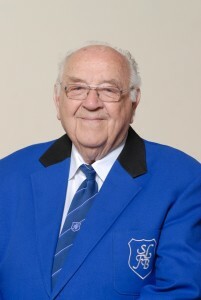 Brian Hillyer is erstwhile band librarian and a founder member of SLFB and served as bandmaster at Gravesend Corps for many years. A celebration was arranged by his family for his 90th birthday and a large group of family and friends spent the afternoon celebrating with Brian. 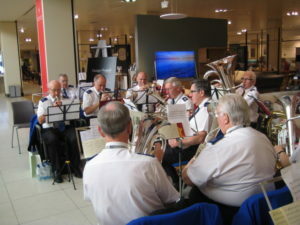 SLFB attended en-masse and were enhanced by a number of friends who brought their instruments to the party and played with us. 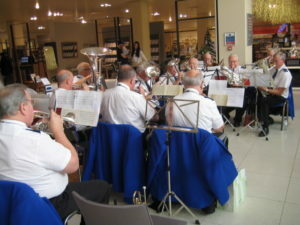 The afternoon included many ‘light’ numbers from the SA band repertoire following which everyone enjoyed an excellent buffet before joining in a ‘last night of the Proms’ section with guest vocal soloist, Lisa Davis, leading the way and inviting the full group to sing heartily at the appropriate times! This was a great occasion and everyone is looking forward to a repeat in 10 years time, during which the band will continue to benefit from Brian’s ongoing hard work and organisation of the library as well as many other things. 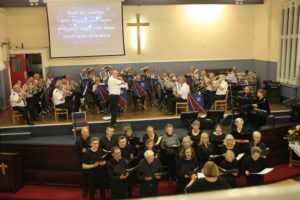 The following Monday evening saw the band taking part in a programme of Easter music at Royal Tunbridge Wells Corps and enjoying fellowship and worship with the RTW Songster brigade and many folk from the Corps. 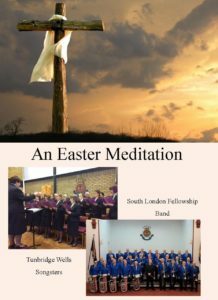 It was an expectant audience who gathered at Royal Tunbridge Wells on the Monday evening of Holy week for an Easter Meditation by the Royal Tunbridge Wells Songsters and South London Fellowship Band. Anticipation was soon fulfilled and as the evening enfolded us in the timeless beauty and challenge of the melodies and words, it was indeed a time of rich blessing. The Band opened the evening with the beautiful ”A special moment” and throughout the evening the familiar strains of “I know a fount where sins are washed away, “There’s a wonder working power in the blood of Calvary “and “For our transgressions”, brought us all again to the foot of the cross. The Songsters sang, “For God so loved the world” and “Wondrous cross “which enhanced the sensitive playing of the band. 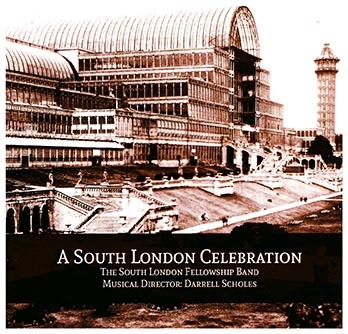 The evening flowed quietly and unannounced in a sense of deep worship and was greatly enhanced by the superb graphics, which came before us enabling us all to share again the beautiful words to the melodies and evoked how we feel at this time. The evening was skillfully and quietly led by Major Val Mylechreest who challenged us to ask ourselves what Jesus sees as He looks at us. She reminded us that He sees us just as we are and the band then played the beautiful “Just as I am “. Crosses had been placed on the Holiness table and throughout the evening many of the band, songsters and congregation quietly came forward and took one. The meeting closed with the Songsters singing, “Tell all the people” challenging us all to share the wonderful message of Salvation for all. Click on Contact Us, above, to ask any questions or send us any comments you may have.